Dateline: Saturday 22nd JulyWe had an early start. We had to check in by 5:30am, this meant a 3:00am start, latest. And we were a little late! Fortunately we always build in some wiggle room, and so there was no problem. The flight to Reykjavík was on a tiny little plane (well, it was a jet, but compared to the other things at Gatwick it looked tiny - it wasn't really). We had a full day to explore and be tired in. We had a transfer from the airport, and were delivered to Hotel Björk, a nice enough place, and it had free internet access in the lobby. It felt like we were in the outskirts of town, but soon came to realise that this is Reykjavík! Upon arriving from the UK, it feels more like a provincial town than a capital city - after a week driving around southern Iceland, it feels like a metropolis! 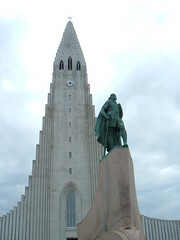 After settling in, we walked along the shoreline, past Sólfar (finding a geocache there), and then up to the cathedral. This is a distinctive cathedral, reminiscent of large basalt columns which rise from the ground. It's also a modern cathedral - there is a lift which goes up to the top. We toured Reykjavík for a while, seeing the Alþingi, and other such places, stopping in Café Paris for a bite and a drink, and then walking near Tjörn, before returning to the hotel for a snooze in the late afternoon/early evening. We woke at 11pm to find it was still light out, despite not being in the arctic circle, we were close enough that the sun only dips just below the horizon - so the middle of the night feels like early evening in the UK. It's still light out. For the first few nights I was glad of the blinds supplied by airlines (we still had some from the India trip, there were none supplied for the Iceland hop). 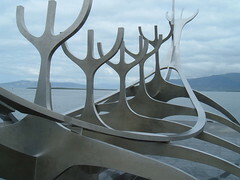 Good points about Reykjavík so far: it's easy to get about, it has a few interesting bits and pieces to see. Bad points: The graffiti - it makes the place feel generally run down - and at times it can seem too quiet for a capital city.